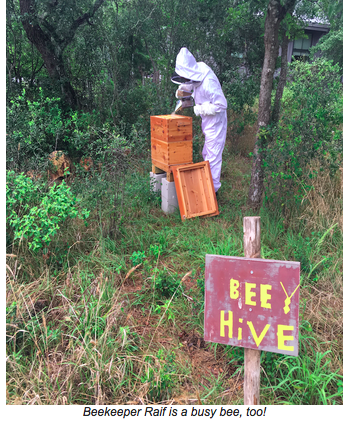 Sage Hill Inn & Spa is now home to two bee hives, roughly 50-70k bees! Their caretaker and master beekeeper is Sage Hill's very own General Manager Raif. He checks on them every other week to make sure there are no pests in the hives. This season the queen has laid many eggs and workers are busy collecting pollen and nectar. Since Sage Hill has plenty of wildflowers year round, the bees are very happy. During the cold months some of the workers die off and all of the males are thrown out of the hive leaving only the females to keep the queen warm and safe. Central Texas gets one honey flow in late spring and early summer and then again in fall when the fall wildflowers are in bloom. The average per hive is 25-30 lbs of honey, sometimes up to 100 lbs. Sage Hill will harvest again in early summer and fall of 2017. Sage Hill's queen bee has stopped laying for the time being and won’t lay again until early February. SInce this year was Sage Hill's first harvest, the honey and wax collection has been minimal. However, next spring and summer, Sage Hill should have plenty of happy bees making lots of honey to use in the Garden Spa for face and hair masks and for the wax used for hand and foot dips. In the kitchen at the Sage Hill Restaurant, the honey is used to make sweets, vinaigrettes and to sweeten tea.